Safety is one of my biggest concerns when it comes to going walking, going to an unfamiliar place, or spending time outdoors with my family, especially this time of year when it gets dark outside earlier in the evenings. Having a cell phone is a great accessory but in the event of an emergency it is not always possible to dial 911 or reach emergency services without someone realizing what you are doing. Wouldn’t it be easier if you could simply push a single button to alert others and emergency personal. Well now it is possible for you to do that with React Mobile. For example, if you see someone breaking into a car you might not want the burglar to realize that you just witnessed a crime. If you dial 911 or talk on your phone, they might here you talking and run away. Instead, you can send out an SOS to your approved contacts and they can alert the police that you are in trouble. React mobile is an app for your cellphone that allows you to send SOS messages with one touch to a list of self selected contacts. It will send your contacts an alert them that you are in trouble and it gives you the option to dial 911. The app is available for both Iphone and Android smartphones. This app is easy to install and set up. After I downloaded the app on my smart phone, I was able to either create a new account or use my Facebook account. I choose to use my Facebook account so that I didn’t have to keep up with another user name and password. The app gives a step by step guide on how to use the app. The app has a follow me feature and it allows you to share your current GPS location with your self selected contacts. This is a perfect feature if you plan on running or walking alone, wanting to keep up with your children or teenagers, have a college student, spend time away from home, or great for situations when you are concerned with your safety. There is a one touch button “I’m Safe” button that you can push to let your contacts know that you are safe. 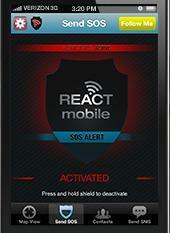 If a security threat happens, simply use the one touch button to activate an SOS alert. Even if you don’t reside in the US or decide to travel outside of the US on vacation, you can easily change the settings in the app. You will need to change you send out an SOS alert so that it will pop up the correct emergency number depending on the country that you live in. The app is currently available for use in the following countries: United States, Mexico, EU, Australia, China, Japan, Israel, Jamaica, Philippines, Thailand, Brazil, Argentina, and India. When you hit the button to send an SOS alert, it will send a text message and an email to your self selected contact with a message saying that you are in trouble with your current location. You can also choose to broadcast messages to your Facebook and Twitter account for additional awareness of potential problems. Check out the video below for more information about the app. Follow ReAct Mobile on Facebook and Twitter. Do you plan on installing this app on your children’s smart phone?